GUARANTEE: If you are not satisfied with our product received, you can apply for unconditional return and refund in 180 days. In terms of any problem of this product, you can send emails to us at any time. We will reply you as soon as possible. EASY TO TWIST: Adopted Oxford soles, this taekwondo shoe is soft and easy to twist which give you a comfortable wearing experience. Non-slip sole design ensures a safe and comfortable wearing.We recommend you to choose two size bigger than usual for more comfortable movement. SOFT & BREATHABLE: The innovative shoes with exquisite design and workmanship, is soft and breathable, which ensure a comfortable movement, especially design for Taekwondo, Boxing, Karate, Kung Fu and TaiChi. WIDELY APPLICATION: This premium shoe is especially designed for Taekwondo, Boxing, Karate, Kung Fu and TaiChi. Also can be used as running or exersice shoes for its softness. FULL SIZES: Simple and classic design with good quality, and we have 26-45 sizes for your choosing, suitable for both adults and Kids. The innovative shoes made of senior breathable material, which is durable, and non-slip with exquisite design and workmanship. It is lightweight and breathable, play its functional roles well, and ensure a comfortable movement, especially design for Taekwondo, Boxing, Kung Fu and TaiChi. --EASY TO TWIST: Adopted Oxford soles, this taekwondo shoe is soft and easy to twist which give you a comfortable wearing experience. Non-slip sole design ensures a safe and comfortable wearing. --SOFT & BREATHABLE: The innovative shoes with exquisite design and workmanship, is soft and breathable, which ensure a comfortable movement, especially design for Taekwondo, Boxing, Karate, Kung Fu and TaiChi. --FULL SIZES: Simple and classic design with good quality, and we have 26-45 sizes for your choosing, suitable for both adults and Kids. 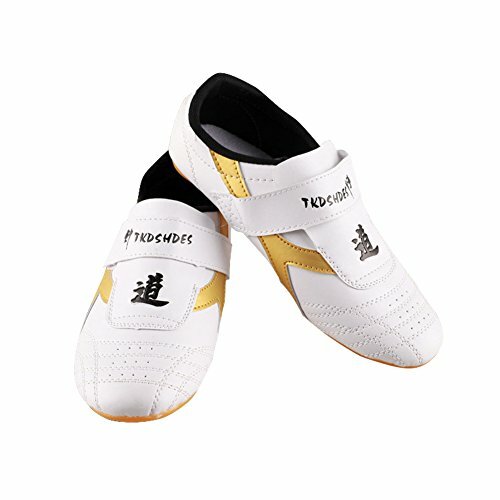 --WIDELY APPLICATION: This premium shoe is especially designed for Taekwondo, Boxing, Karate, Kung Fu and TaiChi. Also can be used as running or exersice shoes for its softness.